Waiting for someone or killing your time while it's not yet your cue for interview, whatever it is you'll enjoy sitting in this modern lounge chair perfectly designed for modern day office. With a magazine to read, with your tablet or a net book perhaps you can make your time worthwhile here while looking very chic in this stylish modern unique chair made especially for stylish office too. Well it can also be perfect for your home when you want something different especially if you have some guests waiting for you. 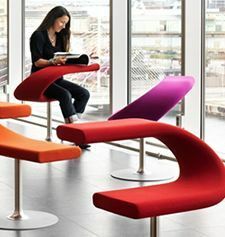 It just caught my attention when I was browsing the net and looking for some unique and creative ideas for office furniture.